Christmas is a season of traditions, but you may be surprised by how many different ways people celebrate. We asked around and discovered there are as many ways to celebrate Christmas as there are presents in Santa’s sleigh. Read on for 10 stories that may inspire you to create more personal, meaningful family Christmas traditions. As a young adult, it became a tradition for me to spend Christmas Eve at my best friend’s house. They were of Polish ancestry, and they’d serve traditional Polish foods. His mom would play the piano and I, along with my friend and his brothers, would sing a wide variety of Christmas carols, folk songs and show tunes. Then, we’d go to Midnight Mass. I would spend all day Christmas with my family. Around lunchtime on Christmas day, I go to my mother- and father-in-law’s with my husband and our two daughters. While the girls and their cousins ogle and shake the presents under Nana and Papa’s tree, my husband and I make a break for the kitchen where the tamales are. There are usually beans and rice, too, and sometimes Mexican bread for dessert. My mother-in-law is Mexican-American, and I’ve loved marrying into this tamales-on-Christmas tradition. Somehow, they always hit the spot after a big morning of seeing what Santa brought! My husband has a large family, and my own isn’t exactly small. Because we can’t be with everyone we care about on Christmas Eve, we take a picture of ourselves in front of the fireplace and next to the tree. We text the picture (along with our warmest Christmas Eve greetings) to all our family. Within minutes, our phones start vibrating as pictures of different families and relatives arrive, showing us what their celebrations look like. It’s a wonderful way to feel like we’re sharing the moment with them. When our first son was young, he suffered from asthma, and because a “real tree” could trigger an attack, we suddenly became a “fake tree” family. Which was fine. We got a tall, fluffy fake, and once we hung our family ornaments, it was perfect. As our son got older, he outgrew his asthma, and we also welcomed a second boy. With so much kid stuff overtaking our home (happily, of course), we decided on a new Christmas tradition: two trees. We brought a real one back in—its fragrant smell bringing back wonderful memories—and decorated it with all the ornaments our family had collected over the years. Then, we set up our fake tree and decorated it with a more elegant silver-and-gold theme for us grown-ups. 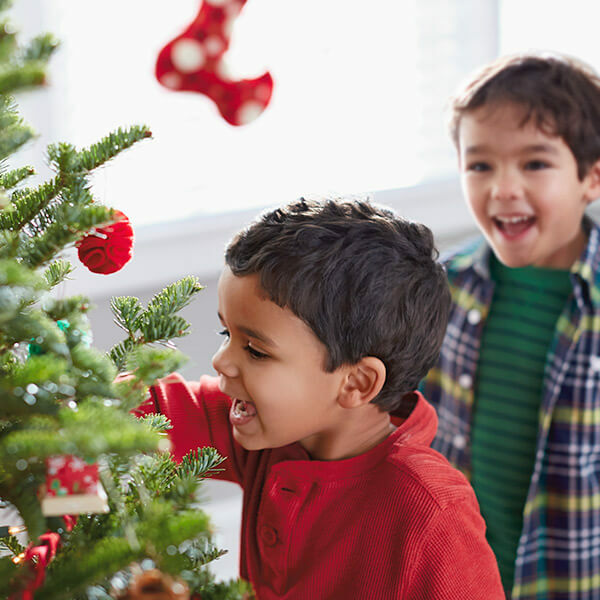 My wife and I love it because we get the best of both worlds—and the boys love it because it means more real estate for Santa to pile with presents! We always go to a movie together, the entire extended family. This can be challenging, as the age range has been from mid-70s down to early teens, and one of the grandkids can’t stand musicals, and one of the grandparents doesn’t like movies that have too many dark scenes—literally, like night scenes. This is all mitigated, however, by the way we’ve scheduled it the last few years: huge meal before the movie and dessert(s) after. My relatives will sit through pretty much anything if there are enough desserts after. Every year on Christmas Eve, Santa somehow manages to drop off some “advance” presents under our tree. There is one gift for each member of our family—and we always know what it is going to be: a set of cozy new pajamas perfect for winter weather. We put on our new pajamas and show them off to each other before going to bed. Somehow, wearing the jammies from Santa seems to add to the excitement of Christmas Eve night, like a promise of the BIG present reveal on Christmas morning. We participate in at least five different Christmas gift exchanges every year (due to the bush-like nature of our family tree). We color-code wrapping paper to make sure the right gifts go to the right places. For our own tree, we put an owl on top. That tradition started because, back in the day, my wife and I had a black artificial tree that looked more like something for Halloween when we got it home. So for humor’s sake, we put a black owl with fiber-optic eyes on top. The fiber-optic owl has been replaced by a more appropriate snowy owl and the tree isn’t artificial these days, but the tradition remains. In my hometown of Phoenix, it was popular to drive around and look at Christmas lights. We didn’t have snow and ice to contend with. Some nights it was mild enough that you could drive around with the windows open. Looking at Christmas lights was so popular that the newspaper would publish maps of the best areas to go. And because the weather was so mild, sometimes you’d just park and go on a walking tour of a neighborhood. Some houses would even allow people to come inside. Every year, my two daughters help me decorate our Christmas tree. I never meant for this to become a tradition. I just started letting them help as soon as they were old enough because I’m lazy and didn’t want to do it all myself. But it’s definitely become a tradition. We play Christmas music and enjoy pulling ornaments out of the box layer by layer. Each girl has dibs on hanging “her” special ornaments. They have fun rediscovering what they used to be into a year (or two, or three) ago, and we share a lot of fun memories this way. The only ornaments we three girls don’t hang are the flocked glass balls handed down to my husband from his grandma. He doesn’t trust any of us with these! Oh, well. I think I already mentioned that I’m lazy. I’ll take all the decorating help I can get!